Add Bud Norris to the list of Blue Jays relievers who could be dealing with injuries. Add Bud Norris to the list of injured #BlueJays pitcher. He was supposed to pitch today and was scratched after not feeling good while throwing earlier. Tepera, Axford, now Norris. Yikes. According to manager Charlie Montoyo, Norris was supposed to pitch Thursday but was scratched after not feeling well while warming up. The Blue Jays say he will be evaluated Friday. Thursday was the final day for Norris to opt-out of his minor league deal, though there's no indication that's related in any way to the potential injury. But the very risk of an injury is concerning to a Blue Jays team that may have already lost two late-inning guys for an extended period of time. Ryan Tepera is scheduled to see an elbow specialist over the weekend after being diagnosed with inflammation while John Axford is dealing with a stress reaction in his elbow. The Jays signed Norris earlier this month to a minor league deal with an invite to spring training. 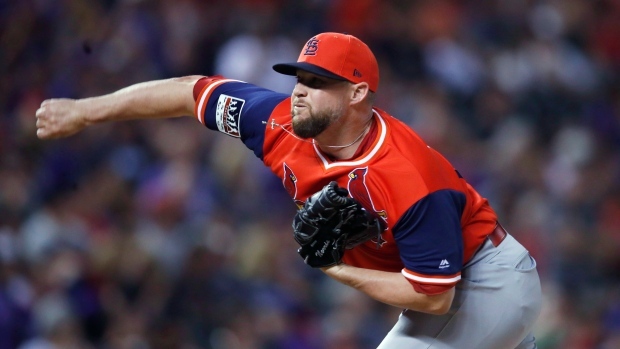 The 34-year-old was 3-6 with a 3.59 ERA in 57.2 innings out of the bullpen with the St. Louis Cardinals last year. He had 67 strikeouts and 21 walks. In his 10-season career, Norris is 67-90 with a 4.45 ERA. The native of Greenbrae, Calif., primarily has been a reliever the past two years after beginning his career as a starter. Norris also has spent time with the Houston Astros, Baltimore Orioles and Los Angeles Angels.